Hi there! I finally managed to translate the whale tutorial, thank you for your patience. I hope it is helpful for those who don't speak Finnish, or don't trust the Google translator. I'm sorry I also have to put up this disclaimer: It's OK to link back to this post, but it is not OK to copy all the photos and the tutorial, or translate it to another another language. Posting this as your own creation is even worse. Making whales for yourself or as gifts is ok, selling them or producing them commercially is so not OK. Would you be happy if you had this happen to something you made and shared on your blog? Didn't think so. Stealing just isn't nice. 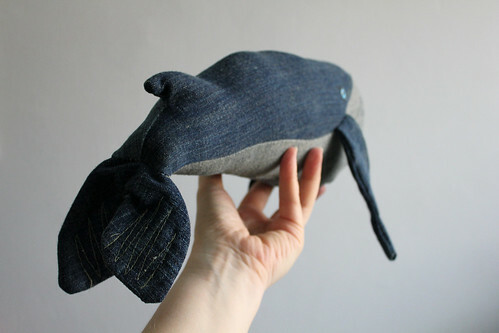 For a whale you need a leg from a pair of old jeans, a tiny bit of blue fabric for the eye, filling, sewing thread, a sewing machine and a little bit of patience. 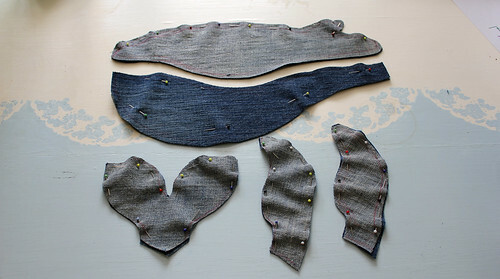 Start by cutting the pieces: 2 for the back, 2 for the belly, 2 for the tail, and 4 for the fins. 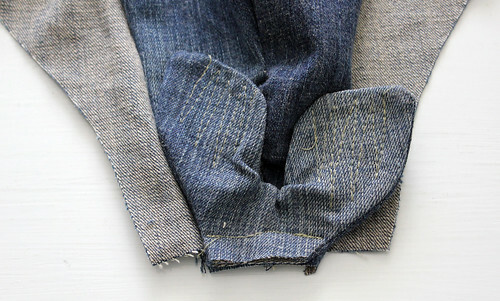 Note that for the belly pieces the right side of fabric is the reverse side of the denim. The shape of the belly piece is copied from the back piece. As you can see, I draw straight onto the fabric with a red ballpoint pen. 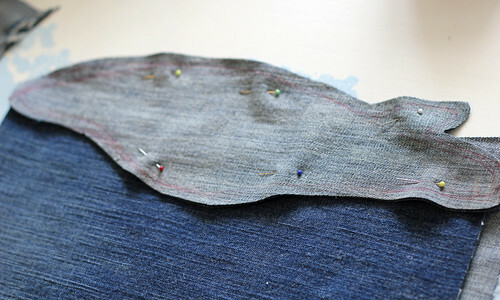 Sew the tail pieces together, turn inside out and add some decorative seams (I like to use a contrasting colour thread). Do the same with the fins. Sew the decorative seams on the belly pieces on the reverse side of the fabric. The seams have to curve a bit, following the shape of the piece. Join the back and belly pieces together. Remember to insert the fins in between the seams. Turn the pieces to check the position of the fins. Don't pay attention to apple pieces left on the table by Big Brother. At this point I noticed that the back is too chubby, so I added a new slimming seam. Attach the tail to the back pieces. As you a see, it turned out slightly askew, but I chose to think of it as a piquant detail. Sew the eyes. 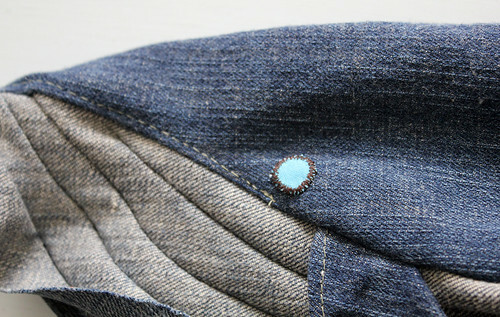 You'll need a small piece of light blue fabric, which is handsewn with many tiny stitches. You could of course embroider the eyes, or buy them from a store, or use buttons, but I prefer this method. Also sew a seam which marks the mouth. Add a dot of black, and a tiny dot of white. Sewing thread is perfectly good for this. 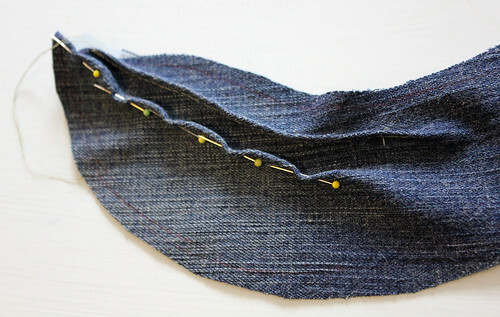 Sew the belly seam, leave a gap for the filling. One notices the belly too is too chubby. A couple of decorative seams and the new belly seam help. Turn inside out, fill snuggly and hand sew the gap. Tadah! The whale is finished! Here are the whale brothers, top one belongs to Big Brother, one below to Little Brother. Similar, yet different, just like my boys. This picture probably says it all about our household. I'm not sure if this was helpful or not, but if you decide to make a whale, please let me know, I would love to see them! The pictures make it very clear to follow. It is the most realistic whale pattern I have found. I am trying to make a Southern Right Whale. Thank you, Helen! I'd love to see how your whales turn out. Thank you for posting this! These are utterly adorable. This is STUNNIG! I had to pin it on pinterest :) I had some trouble in doing that, this page doesn't want to be pinned! Will try to sew this sweetie soon, thanks again! Thanks! I've no idea why the images don't want to be pinned, sorry! Love love love this! So adorable. I found it on pinterest but it was not linked to you so I passed the correct link on to the people who I got it from. Hopefully they will do the same since you obviously deserve all the credit. If you ever make another it would be amazing if you could make a template for this. I'm hopelessly bad at getting the right proportions for things. I'm still going to attempt this either way! 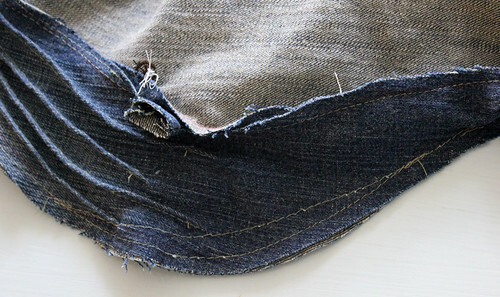 I just tossed two pair of old jeans last night but there is still time to save them! Thank you for the pinning credits, Nikita! I'm planning to make a few whales for sale, but templates... I'm pretty much hopeless when it comes to patterns, so I'm afraid my templates might be more confusing than helpful. Sorry! Hello! Thanks for posting this great design and tutorial, I made one and posted photos on my blog http://diytime5.blogspot.com/ (and I linked it to you of course!). I'm not a creative person, but I'm good at following directions, so thanks for sharing your creative talent with others. It's inspirational! Hi Elizabeth, thank you for your kind words:) Your whale turned out very cute! Hi, I'm dying to make this for a friend who lives in Hawaii...how did you make the pieces? Did you just free hand them or did you trace them from a picture?? i really liked your whale. so, here is my version of it: http://strawberri.es/blog/?p=812 thanks a lot! Your whale turned out cute! Thank you so much for the tutorial in english! You are such a talented person! You children are so lucky to have such a creative mom. Kiitos paljon! Hi! 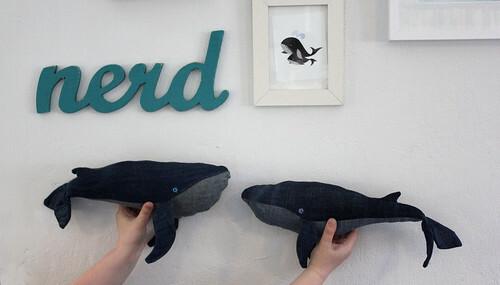 I found the picture of your beautiful Blue Whales on Pinterest. I went to your blog and just knew I had to make this for my 5 year old son!!! His favorite animal in the whole world is a Blue Whale and he LOVES ocean stuff! I pretty disapointed at the time that you didn't have directions in English at the time (Jan.) however, you had such great step-by-step pictures that I was able to make him one. I think he turned out pretty well for being the first stuffed animal I have ever sewn and no English instructions! Please check out my blog Hoosier Girl to see the picture. (I couldn't figure out how to upload a pic, lol.) Thanks again for all your great ideas! He loved it! And now my other two boys want one too! Beautiful! Actually I found this a few months ago on a Chinese page. I shared it on Vingle ( http://www.vingle.net/posts/139401 ) but today I realized that it was yours. :( I changed the link to this page. :) Glad to see the original ! It's adorable!! love this! So adorable... do you up load the templates/molds?? Thanks! There is no template, I draw straight onto the fabric, that way every whale I make is truly unique. Thank you again for sharing your creative project! sooo pretty! You should sell these! Oh dear, the nerve some people have. This just makes me sad. I used your idea and adapted it to make a whale with a mouth that opens and is held closed with magnets. It has a pouch at the back of the throat so that it can "eat" little toys (my son loves the Jonah and the whale story!) I have to admit it doesn't look quite as good, but I'm sure it will be appreciated by my son who is about to turn 4. Thank you so much for the inspiration! I did it ! thanks you fo this great tuto ! 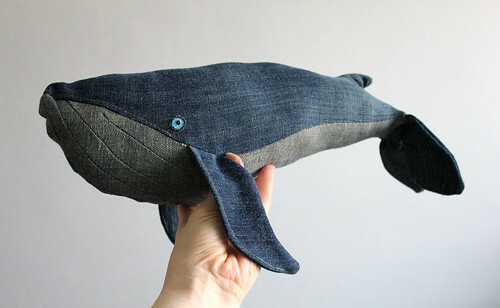 The denim whale is awesome! i love it so much and i shall like to try making it one day! Thank you so much for sharing it and you are so talented, i love going through your blog( unfortunately dont understand the non-english language) enjoyed your art pieces. Good luck with your shop and happy living everyday! I'm glad you liked it, the whale looks great! Thanks Misty! Your whale looks great! The link takes me to ice ship sculpture? This is amazing, thank you so much!!! 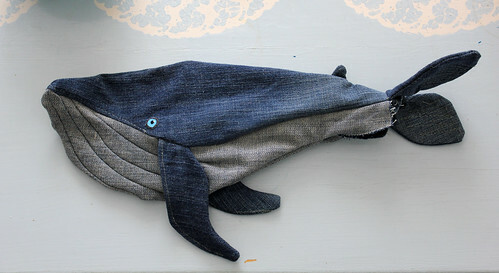 I have been looking at ways to make gifts for my kids with no money this year and this whale is a winner for sure!!! Bonjour, pour une vente au profil de l'association "Je-ted-aller à l'école" j'aurais souhaité réaliser votre baleine. Cependant comme il s'agit d'une vente, je souhaiterai savoir si vous m'autorisez à vendre cette réalisation. Votre site sera mis en lien dans la description de la peluche. Hello, for sale to the profile of the association "-ted-I go to school" I wish make your whale. However, as it is a sale, I would like to know if you allow me to sell this achievement. Your site will be linked in the description of the plush. Hi Mokkona, please contact me via email (address is on the sidebar). I made one today for a friend of mine who is a marine biologist. I hope she'll love it in her classroom! Thanks for a great tutorial. Thank you very much, my wife and I made a whale for my niece. It looks pretty cool. We used another kind of fabric and attached the tail in a different way. Regards and thanks a lot again. Thank you, Jordi, Cloudy Stitches and Joanne! I made one! And I love it. 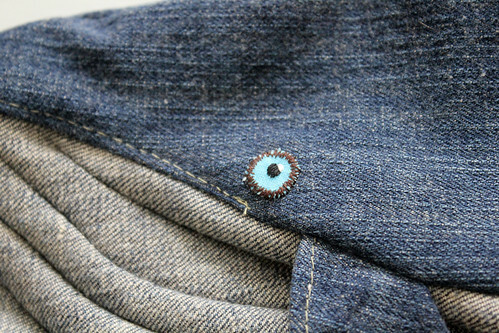 You can check out some pics on my blog: http://bowlsfullofyummy.wordpress.com/2014/05/03/upcycled-clothes-projects/. It was fun to sew! I did the belly a little different, I sewed the decorative seams on the right side of the fabric so they would stand out more, I love the effect. 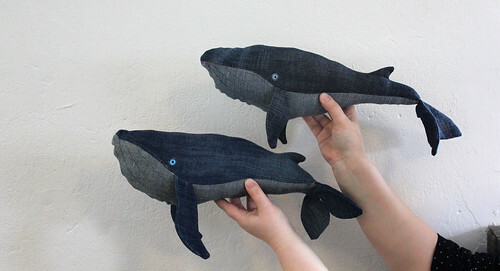 These are beautiful and realistic whales. I JUST LOVE WHALES. Sorry, they are my favorite animal! Thanks so much for the tutorial. No worries, I love whales too! Glad you liked the tutorial. Hello ! Since about 30 minutes I'm trying to find the Pattern, for this amazing Wale. In Juli my Son hast got his 3. birthday and he wants to have a big big Wale…So can you help me to find the Pattern? Or is it without a Pattern? Hi Giusi, there is no pattern, I always draw straight onto the fabric, make it up as I go. Thank you so much for sharing the pattern. I learned to sew just so I could make one for my (now) girlfriend. She loved it! Hi, your tutorial is great! I'm a teacher and want to do a recycling project with some students, would you mind if finished whales were auctioned/ raffled to raise money for charity by the children? Hi! 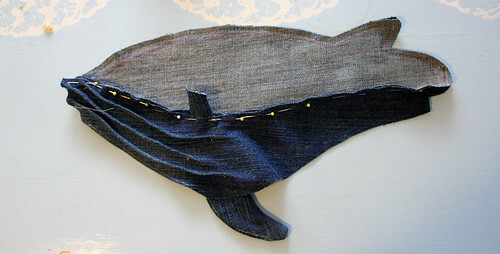 I found your tutorial and with a little help from mama who's better at sewing that I am, I made a whale!! I made it a bit more chubby than yours, and also way bigger, it's 63cm long :) thanks for this amazing idea and tutorial! Good job, your whale looks great! Hello! I made a whale following your tutorial (you can see it here: http://lady-natsuki.deviantart.com/art/Pequod-the-denim-whale-471608322). It doesn't look quite the same as yours but I like it! Thank you very much for sharing the tutorial. It was very helpful, and I admire how you imagined such a complicated and beautiful plushie! Thank you so much for posting this, I loved it. 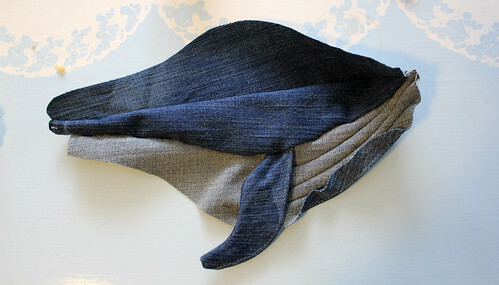 I am going to try and make my whale, haha I have tons of ragged jeans! when I am done I will post a picture back I promise. I have had friends ask me to make them for them and was wondering what your policy is for selling whales made with this tutorial. Thanks! Making whales for yourself or as gifts is ok, selling them or producing them commercially is not OK. I can't wait to make some whale friends. Thank you so much for the tutorial!! What a great idea - I loved your whales the first moment I saw them but have only just got round to finding a reason to make some of my own. Thank you for sharing - I have linked to your post from mine which I hope is okay with you. I made this for my nephew and he loves it. I'll try to get a picture the next time I see him. Also, I saw this on etsy and I thought if I were you I would like to be told about it. It's not just similar it looks like the same pattern to me. Thanks for this tutorial! I can't wait to try it out. Do you have a link to the template pieces? I'd love to make one! I'm sorry, I don't - I prefer to make truly unique pieces, so I always just draw on the fabric. But I think you get a pretty good idea from the photos. Thanks for the tutorial. Had an idea that I would make it large enough to use as a TV. or movie at home pillow. I love this Whale pattern! The style is so good! Thank you very much! Thanks so much for posting this project! I found it after I saw your whale shared online. I didn't know there was a tutorial, so I just referred to your picture. My nephew loves his new friend! I shared on Instagram, and will link back to your post. There is a Balkan villapaita hash tag on Instagram with whales people made by following your instructions! Your whale is so adorable! I absolutely love whales and this is such a cute, unique interpretation. Thank you for sharing your work, the instructions and the English translation. Kind Regards from Texas, US. Thank you so much for this tutorial, I just made a whale for one of my nephews and it turned out great! I'm now about to try and make a squid toy for my other nephew (they are twins). thanks again! Thank you so much for your generosity in sharing this wonderful idea. I will be able to make a gift for a dear friend that I am proud of and I was able to afford. I'm sorry you were burned on people inappropriately sharing, but very grateful to you! Thank you for the translation. I dont even know a little bit of finnish. Thanks for letting us make this as a gift. There is a baby that is getting a whale tomorrow. instead of something expensive from the shops! Thank you soo much, my son (and I) loves his, and it was so easy and fun to make, even though Im not an experienced seamstress. Hi I saw this on my Pinterest board and I knew this would be perfect for my recycle project for school I will send you the pictures of my whale when I'm done and finished!!!! Thanks for the great creation!! I thank you for this tutorial. You can see my "balum" here. "Balum" will be the mascot of my van trips. "Balum" is whale in breton. Incredible! Was wondering what to make with these wrangler legs I've got. This will be perfect for my baby niece :o) Thank you for sharing! Tämä on minun ensimmäinen yritys denim valaan ompelemisessa. Olá Ficou incrível seu trabalho gostaria de faze-lo, por gentileza seria possível você me ceder o molde do trabalho? Hi Mevrouw. 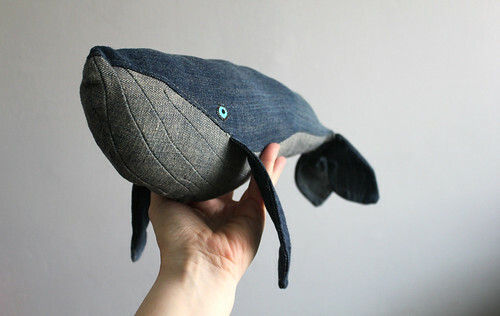 Since years I wanted to sew your wonderful denim whale. Now it's done (http://www.merlanne.lu/?p=9406). Thanks for your idea!! Just wanted to say thank you for this FANTASTIC post and idea. I've made my own pieces inspired by yours and have sewn three whales already with plans for more! I love this project so much :) THANK YOU!!! Is this your channel? If not, then you should let her know that she copied this blog post EXACTLY. So beautiful and such a helpful and funny description. Thank you! So beautiful and VERY helpful !!! Great site !!! Such an awesome idea. Wonderful pattern. Love this little craft DIY tutorial. So cute! Such an excellent diy tutorial. Thanks for share. Where is the pattern please!? Thank you again, have a good day ! that Independent Kolkata escorts incorporates every one of those profitable subtle elements. oooopss!! That is soo creative. 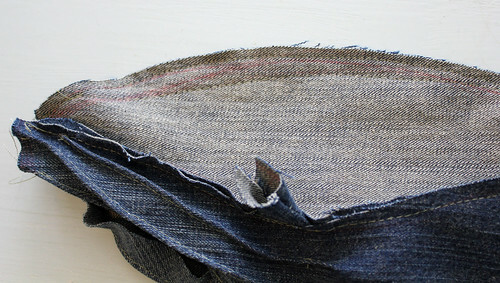 I have also written on Recycling Your Favorite Pair of Jeans! but I didn't think about creating a fish from jeans in my dreams even. Thumbs Up! Nice Idea its Look great ..
Just wanted to thank you for this great idea and tutorial. I'm a fan of whales, and so is my little 3 yr-old. I just finished a whale for him, which he received after coming back from a stay at the hospital - a most welcome gift idea. Thank you! Ujjawal Packers and Movers are trusted and 20+ years of the experienced in this field. We are government certified and done our work in the given period of time. Villa pitää valaankin lämpimänä. Even a whale stays warm with wool. Ethän lainaa kuviani ilman lupaa. Please don't use my photos without permission.